Russ Krachun shares his philosophy and his multitude of in-hand communication methods in this clinic. He will educate how to communicate with your horse through your hands while using the horsemanship rope, and through body language and voice commands. Russ will explain how “Discover Horsemanship Philosophy & Methodology in the Round Pen” transfers to your in-hand communication methodology and how they support one another. In-hand communication methodology prepares the horse mind, improves mental abilities, develop coordination, balance and confidence. 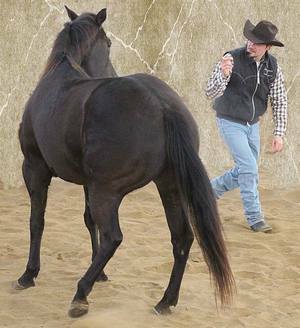 These methods not only develop physical and mental abilities of the horse’s body, but also develop body language and communication between the horse and the horseman. This understanding is essential in our daily routines with our horses. Participants will also learn how to develop their own physical abilities and confidence by improving their own balance, coordination, and communication with the horse on the ground. This clinic prepares and leads to the next educational foundation clinic of Kozak Horsemanship. 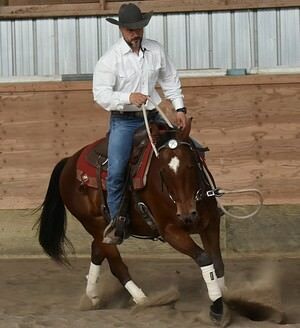 Each participant should be confident on the ground while working with the horse on the lunge line at various gaits. The participant ticket allows one participant only, no other family member, helper or transporter will be allowed to view clinic. Spectator tickets are also available to purchase on line for your friends or family. Participants will be required to sign liability waivers, and photography/videography waivers at the clinic. Participants who do not have their own horse or chooses not to bring their own horse; may choose to work with a Kozak Horsemanship facility horse. Please confirm by email rkrachun@yahoo.com that you wish to take advantage of this option. Helmets are required for each participant. Equipment may be purchased at the Kozak Horsemanship Facility, or participants may choose to rent the “Foundation Kit” which includes all of the required equipment, for a fee of $15.00 plus HST for the duration of the clinic. Beginner horses are welcome at this clinic, but must be safe in hand and be able to lunge in the left and right directions at a walk, trot and lope. An up to date vaccination report is required for each horse. Stall rentals are available for your horse for the fee of $15.00 plus HST per day. Stall rentals includes hay, water, shavings and clean out once each day. If you would like to reserve a stall, please send your request to rkrachun@yahoo.com after you have purchased your participant spot. All learning and education is at the level of the receiver. It is important to know that it takes time to develop coordination and muscle skills, and it is also very important to practice and work with your horse regularly in order for you to succeed. Russ Krachun Kozak Horsemanship is not responsible for the final results that you and your horse reach during or after the clinic. Russ Krachun Kozak Horsemanship reserves all rights in the methodology explained and presented. The Participant Ticket - $180.00 all 3 days ticket is sold out. You can try another ticket or another date. The Spectator/Auditor Ticket - $75.00 all 3 days ticket is sold out. You can try another ticket or another date. The Spectator/Auditor One Day Ticket - $40.00 ticket is sold out. You can try another ticket or another date.